This hands-on project steps through a simple example of reading the on-chip temperature sensor. Reading the temperature sensor can be a rewarding project in itself. It confirms that you have completed the software build and the hardware setup of the ADC, and were able to program the microcontroller successfully. 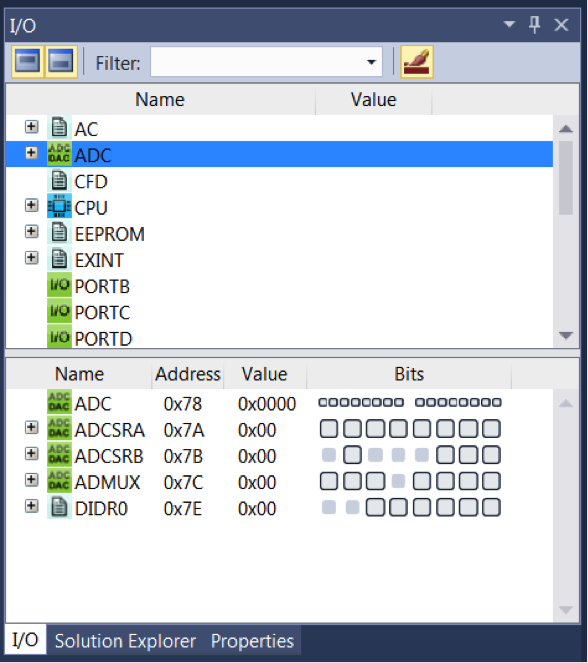 Finally, the debugger is used to view the temperature using Studio 7 output window. The on-chip temperature sensor is coupled to a single ended ADC8 channel. Selecting the ADC8 channel by writing ADMUX.MUX[3:0] to '1000' enables the temperature sensor. The internal 1.1 V voltage reference must also be selected for the ADC voltage reference source in the temperature sensor measurement. When the temperature sensor is enabled, the ADC converter can be used in single conversion mode to measure the voltage over the temperature sensor. The voltage sensitivity is approximately 1 mV/°C, the accuracy of the temperature measurement is ±10°C. The Device Selection window will appear. In the search bar enter 328P, then select the device Atmega328PB and click OK. This project reads the internal temperature sensor, converts the result to degrees centigrade, then stores the result in ADC Temperature Result. 1) The main.c file is where the application code is added. The project has a main.c file already created but it only contains a while(1) statement. Modify main.c by entering the lines in the gray code block below. #include <avr/io.h> is automatically added to the main.c file when it is generated. This should always be placed before the main(void) loop. 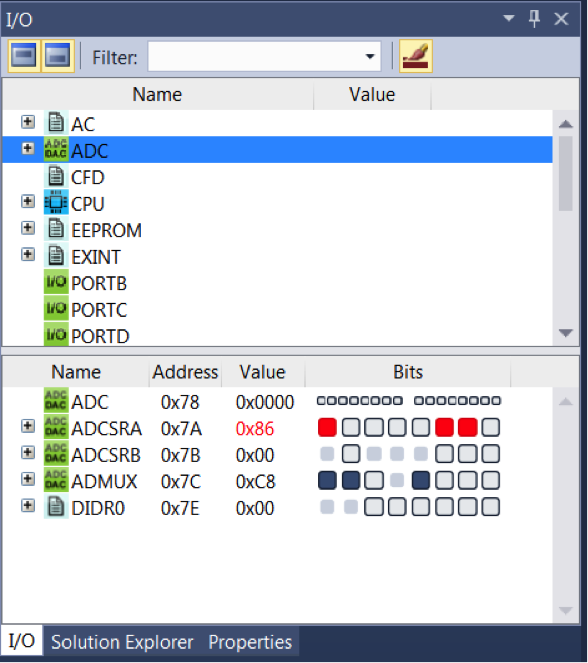 The header file io.h calls the iom328pb.h file that defines the ADC register definitions. 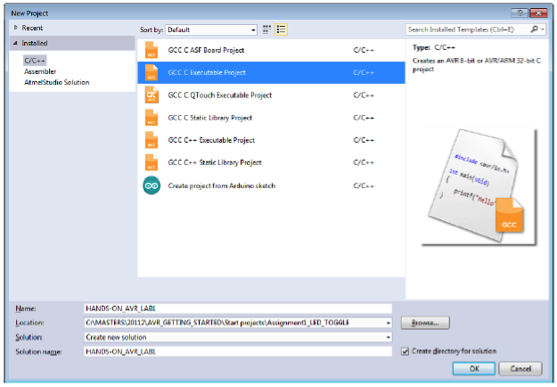 Select Build > Build Solution from the Studio 7 menu to compile the code. You will see a Build Succeeded message in the output window. If there are any errors, check main.c for any mistakes in entering the program code. Connect the Xplained board to the USB port of the computer using the included cable. 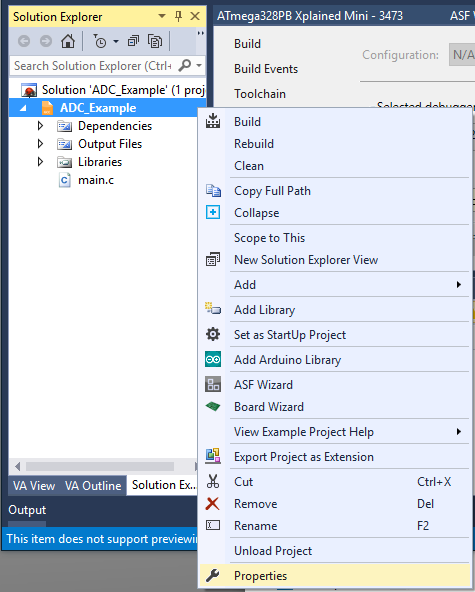 In the Solution Explorer area, right-click on the project name and select Properties. Under the Tool menu selection, choose the mEDBG and debugWire as the interface. 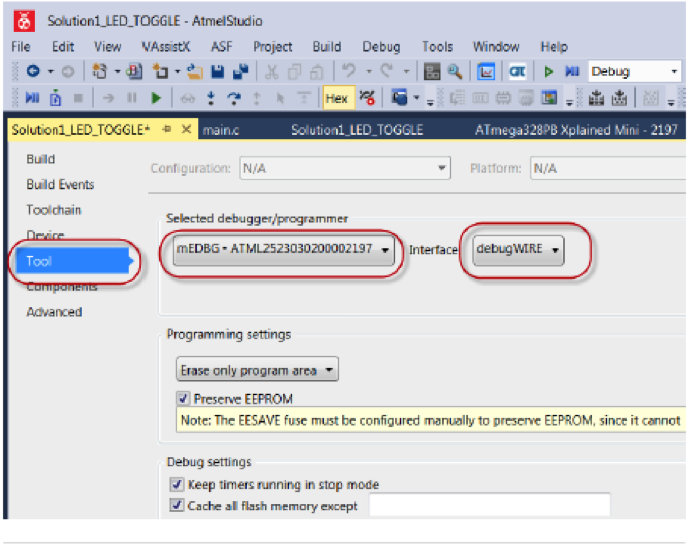 Select Debug > Start Without Debugging from the Studio 7 menu. The project will build and then program the xplained board with the project code along with debug control. Studio 7 will show a Ready message when the programming is complete. If the Xplained board will not connect, there may be a fuse setting causing this to occur. Debugging a device is essential for determining how a program may be running. The temperature of the chip is displayed in the output window. Pressing on it with a finger will heat up the reading by a couple of degrees. The debugWire fuse needs to be reset in order to program the Xplained board in the future. While still running in debug mode select Debug > Disable debugWire and Close. This will release the debugWire fuse. 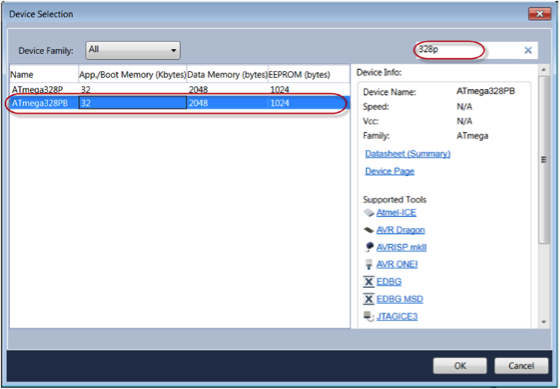 Using the ADC is quite easy and the debug feature makes it easy to monitor the results. This project can become the basis for future ADC related projects.